My first contacts with the world of computers happened with a C=64 of a friend of mine and with a dusty Macintosh at the town’s library, when I was about 10. After a while I’ve managed to convince my parents to buy me a computer: a brand-new Amiga 500 entered my house, essentially as a game machine. Inspired by a middle school book, I’ve started to write some simple programs in AmigaBASIC, keeping on using that language to write a simple paint program (it had functions to draw lines, circles, rectangles, to fill areas, load and save IFF-ILBM pictures, etc…). 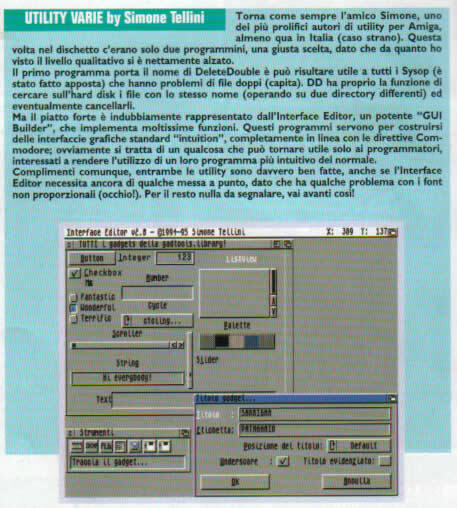 From AmigaBASIC I moved to Amos: a basic variant optimised and targeted to video games writing. This language has been abandoned too after writing a very simple platform and having started another together with a friend (the project stopped at the very beginning: we only made a demo with the main character moving around and the map editor). Another language tried “en-passant” has been AmigaE: I’ve left it to move on to 68000‘s assembly very quickly. In assembly I wrote several utilities, among which DiskOrg is still available, with source code included, on Aminet. 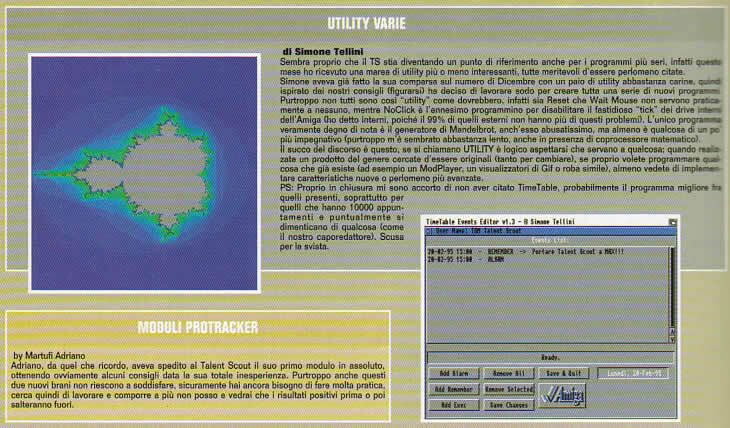 I’ve even made it to appear in the Talent Scout section of The Games Machine (an Italian games magazine), precisely in the issues number 70 (December 1994), 73 (March 1995) and 77 (July/August 1995). Lastly, to end this long discussion, I can’t avoid mentioning the most important application I’ve developed on Amiga: STFax, a fax and answering machine package. The last product I’ve created for Amiga has been Contact Manager, an address book and bookmarks database.